The global insurance industry is emerging from a combination of financial turmoil and economic uncertainty. Nonetheless, industry fundamentals remain under intense pressure with significant challenges around price and service transparency, changes in regulations and distribution models, and the ever-present threat of new competitors. Above all, changes in consumer behaviours and expectations are some of the most challenging to keep up with. Messrs Walter Poetscher and Joel Lim from EY offer usage-based insurance as a possible solution for insurers in today’s challenging climate. The explosion of digital and social platforms means new innovations in other sectors, and retail environments directly influence the expectations of consumers – put simply, customers expect the kind of easy and transparent experience they have in other aspects of their daily lives from their insurer. The so-called “sharing economy” and data revolution, with its disruptive concepts of sharing services and goods and pay-per-usage, has taken firm hold in many other sectors – from ride and taxi share schemes to holiday accommodation. This poses exciting new market opportunities for insurers, as well as enormous challenges. Successful insurance brands in the future will focus on delivering flexibility and personalisation in all aspects of their proposition, from product offerings to service delivery and communications – when and how customers want it. This requires simplified, transparent and flexible products with dynamic pricing and payment capabilities. Insurers who are slow to adapt and innovate will surely be left behind. So how can insurers make the “segment of one” a reality? Usage-based insurance (UBI) provides an opportunity for insurers to tailor insurance to customers, specific behaviours and usage patterns. UBI providers suggest an effective solution has the potential to reduce claims cost by 40%, reduce policy administration by 50%, substantially reduce acquisition cost and price policies more effectively. Insurance companies around the world are more and more attracted to the concept of usage-based insurance. Today, in the motor insurance space alone, there are 165 deployments across 35 countries, representing approximately five million policies. While still a low base, the growth is exciting and promising. Global UBI market penetration is currently less than 1%, however expected market penetration in Europe, Asia and America is expected to be 15% by 2020. 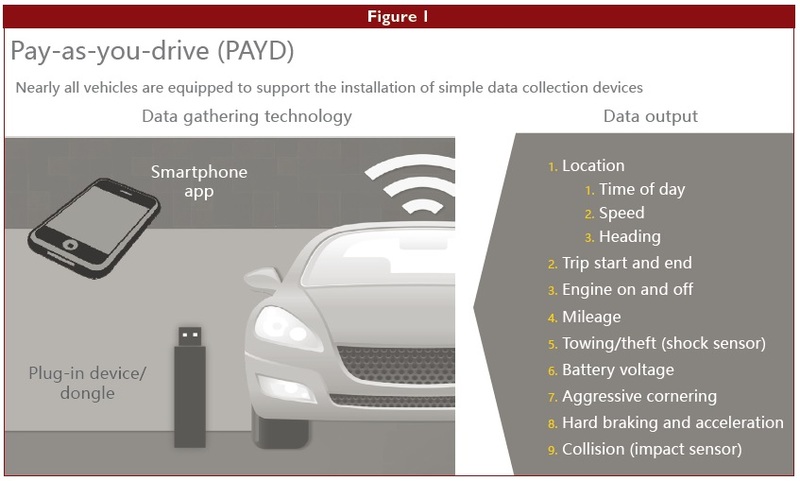 Currently, telematics devices need to either be installed in vehicles, or telematics applications loaded onto mobile devices (or a combination of both), which communicate with software to calculate and manage policy billings based on driver behaviour. Many of the new vehicles manufactured globally have telematics capability already installed in cars at the point of manufacture, providing further growth opportunities for insurance companies as well as non-traditional players. EY is currently collaborating with a world leader in the fast growing insurance telematics industry, in the development of a UBI solution for the Australian and New Zealand market. Tailored solutions are also under development for the rest of the APAC region, leveraging the IP being built in Oceania. This cloud-based telematics platform is designed to help insurers quickly and cost-effectively implement usage-based products for their customers, such as pay-as-you-drive motor vehicle insurance programmes. The innovative solution helps insurers better identify risk exposures, design differentiated products and put the control of pricing in the hands of their customers, who decide how much, and how well, they want to drive. 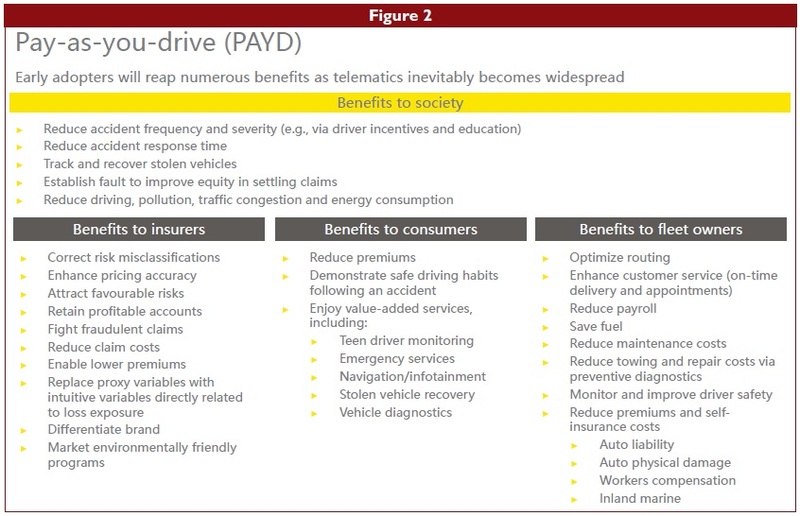 With insurers and policyholders rapidly embracing new technologies and looking for smart ways to reduce costs, “Pay-as-you-drive” insurance solutions will be an important growth trend for the next decade. Not only do they respond to the impending need for insurers to design differentiated, personalised products, they help build stronger, more frequent, engaging and meaningful relationships with customers - something our recent EY 2014 Global Consumer Insurance Survey confirmed customers were calling out for – all while improving underwriting and rating methodologies in what is a highly competitive and commoditised market. 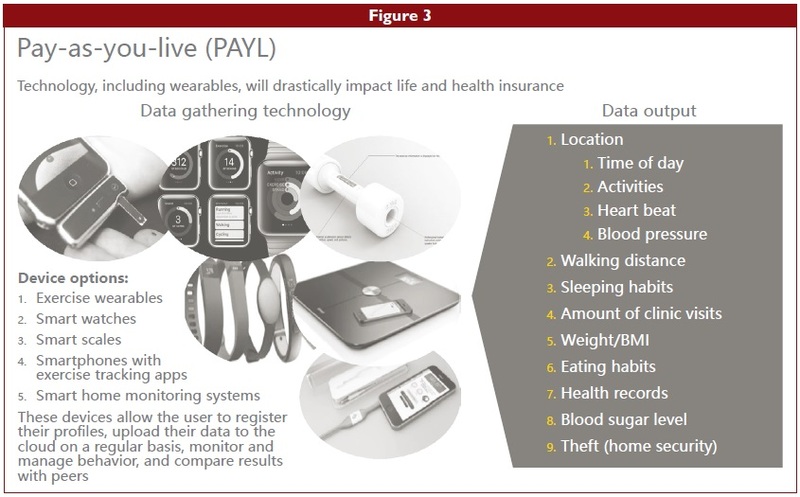 “Pay-as-you-live” insurance solutions have the potential to significantly disrupt the life and health insurance markets. 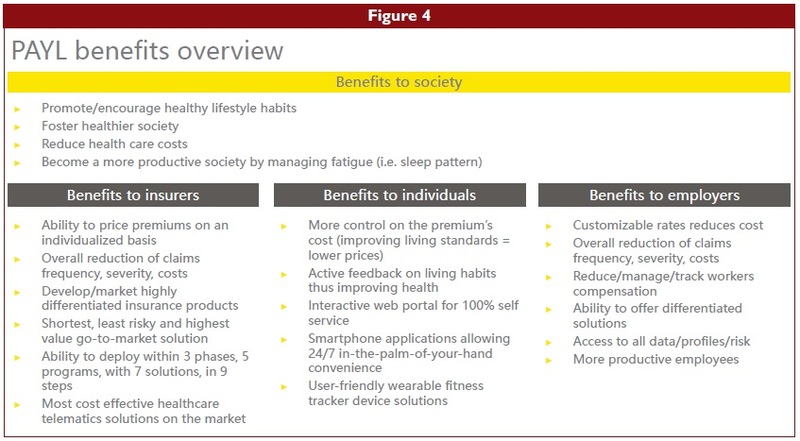 When a customer shows lifestyle characteristics that are linked to better health outcomes such as regular exercise, a healthy number of daily footsteps and a healthy BMI, their premiums can be adjusted to reflect their reduced risk. This clearly benefits the customer through reduced premiums but also benefits the insurer through better pricing, the broader community through reduced critical illness such as diabetes, and the government through the reduced cost of health care. EY believes that this will be a major area of innovation for life and health insurers and has the potential to disrupt an industry that has so far remained fairly safe from the digital disruption that has been seen in lending, motor insurance and payments. We are seeing the pay-as-you-live (PAYL) concept being actively explored by a number of our global insurance clients – they are examining the implications of PAYL to customers, data privacy, regulation and pricing. We believe there will be rapid development in this area as wearable technology gains increased momentum and insurers realise the potential of this technology to provide value adding information and services to their customers. We are currently leveraging our capabilities in health, digital and innovation, analytics and working closely with a leader in the telematics space to leverage their existing pay-as-you-drive technology, to build a functional prototype to use with clients to explore this concept. This innovative approach quickly allows our clients to experience what it would be like to be a policy holder and the potential for this product to help their customers achieve a healthier lifestyle. The resulting data can also be used to begin to investigate modified pricing models and risk factors, the start of the journey of taking these products to market. Mr Walter Poetscher is a Partner of EY’s Performance Improvement Practice in Australia, while Mr Joel Lim is a Partner in EY’s Financial Services Advisory practice in Hong Kong.